Erin Hoe, third on Washington's career singles victories list with 76, has helped the Huskies climb to No. 6 in the ITA rankings. Erin Hoe has got her groove back, and is making her long-awaited impact on intercollegiate tennis. Hoe, a University of Washington senior from Mililani, has won 15 of her last 16 matches and charged from nowhere to 53rd in the Intercollegiate Tennis Association singles rankings. She has a 26-7 season record in singles -- the Huskies' best and her career high -- and leaped into third place on Washington's career singles victory list with 76. Her 15 victories since Feb. 12 include six over nationally ranked opponents and a couple over players who seemed to own her previously. It is the kind of results Hawaii tennis fans were hoping to see after Hoe wrapped up an unbeaten high school career with her fourth HHSAA championship in 2000. She is the only female in Hawaii and one of 34 in the nation to win four state high school championships. But after a brief debut in the national rankings early in her freshman season, and a Washington school record of 25 doubles victories that year, Hoe faded from the spotlight. She said the reason might be that "realizing this is my last competitive year of tennis, I have tried to enjoy it more. I have tried to give everything into this year." Hoe has been a fixture at No. 3 singles for Washington this year, whereas last year she played mainly at No. 6 -- if she played at all. She said that when she beat long-time nemesis Nicole Havlicek of California 6-4, 7-5 in the Pac-10 Indoor Championships on Jan. 17, "it boosted my confidence. I told myself, 'You can do this.' "
She lost the Indoor Flight II final, but has won 18 of 21 since then, including victories over then-No. 19 Erin Burdette of Stanford (to whom she had lost earlier) 6-3, 6-3, and two wins over then-No. 53 Dominika Dieskova of Oregon. "I lost 0 and 0 to Dieskova in the fall," Hoe said, "and beat her both times since." Before starting her current run by beating No. 100 Roberta Fessenko of Sacramento State on Feb. 12, Hoe had not defeated a nationally ranked player since Oct. 28, 2001. She had not beaten Cal's Havlicek since Jan. 13, 2001. "Somehow I've been able to get over the bump and win some of the matches that I've lost in the past," Hoe said. "I'm playing my game a lot better this year than in the past. I'm more mentally prepared, more mentally stable on the court. "I've been able to fight through some of the negative aspects -- like, if I can't hit something because it's not feeling right, I find something else that works." Washington coach Patti McCain said she recruited Hoe because "she was an incredible athlete. I saw a lot of potential skills, but she was going to need to gain a lot of experience she had not had playing at the highest level." Hoe says the step up from high school to Division I tennis was sobering. "I didn't realize the difference between high school pressure and college pressure in a team situation," she said. "It's totally a new ballgame and totally different from junior tennis as well. "In junior tennis, it's just for yourself. In college, your team is standing right on the next court and cheering for you, and the people in the stands are cheering and you feel pressure. They are depending on you for how your team does. "You've got to learn to enjoy it as well." And that is where four years and nearly 200 intercollegiate matches have changed Erin Hoe. Said coach McCain, "She has probably grown most in allowing herself to relax and use her skills. "Believing in herself and her skills was the last piece of the puzzle" that Erin needed to become a nationally ranked college player. Short lobs: Erin Hoe's only loss in her last 15 matches was to No. 31 Sasha Podkolzina of California on March 27. ... She says her strengths are "quickness on the court -- I cover a lot of balls; my forehand, and being left-handed." ... 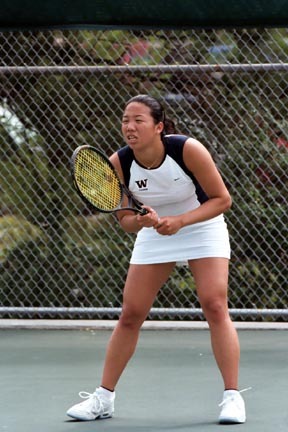 Her victories this season include 6-3, 6-1 over Janelle Kaloi of Santa Clara (Kamehameha '01 of Wahiawa) in October. ... Patti McCain also coached Kari Luna (Baldwin '94) for one year at Washington. "A lot of Hawaiians have talent and skill and they are incredibly tough competitors," McCain said, "but unfortunately they don't get off the islands to compete at the top national level. That is where they suffer, not learning to deal with the relentless pressure of playing top players day after day." ... Hoe said Washington has been a good fit for her: "a great balance of academics and athletics." ... She has made honorable mention Pac-10 All-Academic the past two years. Hoe will graduate in June with a degree in economics and "look for a job," she said. "I'm not sure if I'm ready to come home yet. When the sun is out in Seattle, there is nothing like it." Her coach in high school and junior tennis, Mae Ann Beamer, said Hoe "has come through it because of the person she is. She has a lot of integrity." The highest singles ranking achieved by a player from Hawaii since the Intercollegiate Tennis Association rankings started was No. 25 by Jean Okada (Lahainaluna '92) for UC Santa Barbara in 1994 and 1996. Her highest final ranking was No. 30 in 1996. UCLA junior Chris Lam, who was home-schooled in Palolo, is ranked No. 82 in men's singles. His record is 25-12 in singles and 11-10 in doubles. Lam moved this month from No. 2 to No. 3 on the Bruins' singles ladder after noted international player Luben Pampoulov became eligible. Pepperdine junior Kea Kometani won his third straight game and San Diego freshman Keoni Ruth hit .533 and squeezed home a winning run in West Coast Conference baseball the past three days. Kometani (Punahou '01 of Kahala) shut out Saint Mary's for eight innings on Friday and won 2-1 -- his sharpest outing of the year. Ruth (Kamehameha '03 of Aiea) got eight hits in 15 times up as the Toreros swept three games from Santa Clara at home. On Thursday, Ruth doubled and scored the tying run in the ninth inning. With one out in the 10th, he caught Santa Clara by surprise with a bases-loaded squeeze bunt to the first-base side. No one could reach it in time and the winning run scored. Second baseman Ruth hit 3-for-6 on Thursday and 5-for-9 in a doubleheader yesterday to lift his season batting average to .338 (50 for 148). Kometani has a 2.12 earned run average in his last four games (including a 3-1 loss to Santa Clara) -- slicing his season ERA from 6.10 to 4.15. On April 3 he beat San Francisco 3-2 in his first complete game. Before he became a starter on Feb. 15, Kometani had pitched 54 career games for Pepperdine, 53 in relief. He set a school record of 37 appearances last season and led the WCC in saves with nine. Farther north, sophomore third baseman Zach McAngus (Kamehameha '02 of Hawaii Kai) hit his fifth home run to help Washington State beat rival Washington 14-8. Washington sophomore Lauran Dignam (Iolani '02 of Aina Haina) placed second in the 400-meter dash in her collegiate-best time of 56.18 seconds yesterday at the Pepsi Team Invitational in Eugene, Ore. Dignam took fourth in the 200 in 24.86. At Knoxville, Tenn., Michigan senior Vera Simms (Mililani '00) finished seventh in the 400 hurdles in 58.76 at the Sea Ray Relays. Simms, Michigan's school record holder, is ranked No. 1 in the Mid-East region and 10th in NCAA Division I with a time of 58.21 on March 20. University of San Francisco junior Mariko Joan Shimozaki (Seabury Hall '01 of Kihei) took third place this week at the BYU-Dixie Classic with a 5-over-par total of 221. She had rounds of 73 and par 72. Pepperdine junior Rachel Kyono (Kauai '01) tied for 22nd at the Ping Invitational in Tempe, Ariz., in 6-over 222.